People are movers. Understanding the everyday mobility of people is one of the pillars of creating better transportation networks, developing sustainable urban environments, and regional planning. Origin-destination matrices based on Mobile Big Data provide the most realistic input for transportation modelling and mobility studies. The mobility of people can be represented as regular and irregular (random). 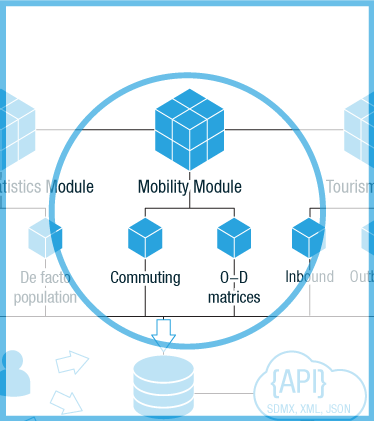 Using Mobile Big Data, our solution provides statistical indicators on everyday commuting data (regular mobility between home and work), regular non-work related movements, and irregular movement patterns. The mobility module includes Commuting and Origin-destination sub-modules. Such continuous ubiquitous information has not previously been available or has been very hard to get. You can learn where people are coming from and where they are going. The origin-destination model used to analyse mobility can help to understand popular routes and provide a basis for better transportation modelling and urban spatial planning. Our main users of mobility data are local municipalities, national statistics office, departments of transportation planning, road administration and maintenance departments, transportation planning and engineering companies, public transportation companies, retail and shopping centers, outdoor media.